Since 1981. Dr. Harte left med school to serve you with authentic Chiropractic... science-based, utilizing gentle adjustments (by hand only), to release your healing power from within. IS COMING HERE BETTER THAN PAIN RELIEF? I know that you’re checking out this site because you’re in pain, now. That’s why I originally went to a chiropractor, a very long time ago. But it turns out that the best thing to do for back or neck pain (or hip, knee, shoulder, TMJ, foot, wrist, TMJ, shoulder…) is to find out the CAUSE, and to correct that cause, allowing your body to heal itself. Just treating the pain is a losing proposition. But you suspected that already. It’s like putting electrical tape over a warning light on your dashboard, or smashing your smoke alarm with a hammer when your house is on fire, instead of calling 911. I’ve been there myself. I’ve got a condition called “spondylolisthesis.” About 50 years ago, the orthopedist put me on Darvon 65 Compound, the “Oxycontin” of that day. He told me that I’d be back when I was 30 or 40 for a TOTAL LUMBAR FUSION. Well, my back went south sooner than he predicted. It came to a head when I was in med school…only 23 years old… pain got unbearable, going down both legs, losing control of my bladder. A chiropractor saved me from this barbaric surgical procedure. He examined me with great care and skill. He X-rayed me, and told me how Chiropractic worked, and what to expect. Being a med student, I thought that Chiropractic was witchcraft, but I was desperate. He adjusted me. He changed my life. Now, I’m here to change yours! Simply put, with chiropractic, life gets better. Ever been to a bad dentist, or a car mechanic that couldn’t fix your car right, or a restaurant with bad food and worse service? I’ll bet that you still have a dentist and a car mechanic, and you still go out to eat, right? Chiropractic is about the liberation of the brain and the nervous system, allowing your body to heal, to function better, to express more Life. 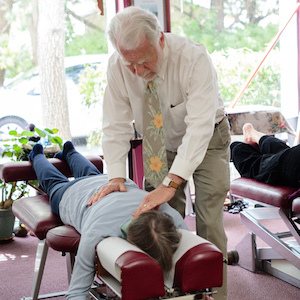 If your chiropractor was just out to “treat’ your pain,” he or she was dead wrong. Especially if he or she was relying on lame gimmicks like hot packs, cold packs, pain glop like Biofreeze, electrical stimulation, laser treatments and disk decompression tables. Even worse if the chiropractor is using one of those vibrating machines instead of his or her hands to adjust! If, in the chiropractic office you went to, there was no science… no X-rays, no neurological scans, no analysis, no plan of care… you didn’t get actual Chiropractic. If you were getting the exact same adjustment every time… if there was no explanation of the seriousness of nerve interference, what is called “vertebral subluxation”… you never got real Chiropractic. Here, you get the real thing! And… you will find no doctor, of any kind, who will work harder for you than I will! Get started today by contacting us to book your first appointment.